Cranberry & Sage Triscuit Crackers! | Dinosaur Dracula! 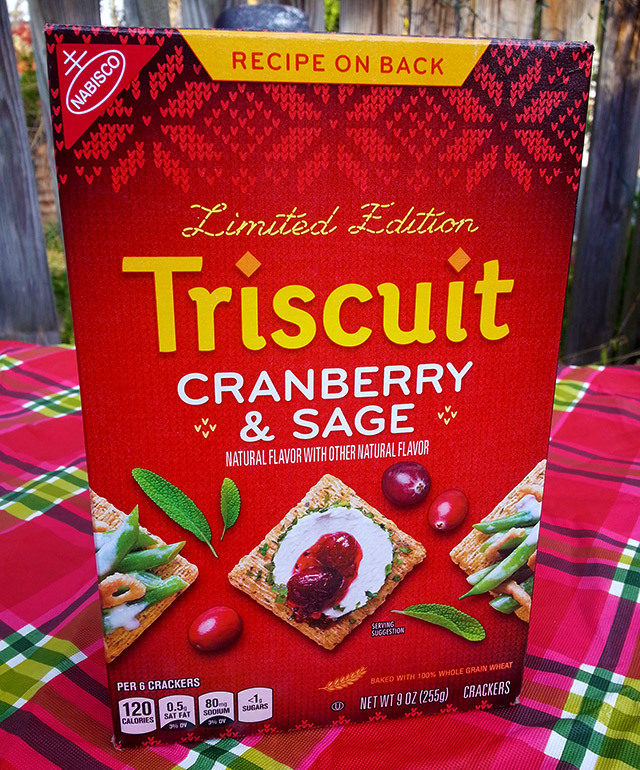 Cranberry & Sage Triscuit Crackers! Judging by what I’ve seen so far, the 2014 holiday season is going to be a great one for junk food lovers. Here’s some early proof! I rarely buy Triscuits anymore, but it’s only because I can’t be trusted around them. 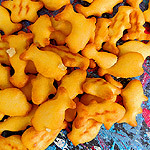 Like Pepperidge Farm Goldfish, they were one of my childhood comfort foods, and like Pepperidge Farm Goldfish, I cannot have access to a package without devouring it within five minutes. If I was ever going to make an exception, now was the time, because OH MY GOD, THESE ARE CRANBERRY. Cranberry & Sage, to be precise. Even if this limited edition flavor doesn’t immediately appeal to you, at least admit that they come in a freakin’ fantastic box. It looks like one of the ten dollar throw blankets I buy every December. When you open the bag, you’re met with the stink of something decidedly unlike regular Triscuits. I’d love to pretend that it was some sophisticated scent worthy of big words, but to tell you the truth, it smelled exactly like Franken Berry. Like, there was literally no difference at all. That initial waft died quick, settling into something subtler. 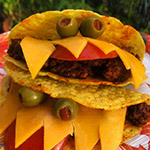 As for the taste, you’ll need to chomp through a few before really “getting” it. They’re indeed fruity, but the shock of a fruity Triscuit is much more pronounced on Triscuit #1 than, say, Triscuit #36. They’re meant to taste like Triscuits and cranberry sauce, and they do! I’m not sure if I detected anything that could be clearly identified as “sage,” possibly because I’m not 100% sure what sage tastes like. I looked it up and everyone says, “Oh, it’s peppery!” But I’ve been down that road with other herbs. They’re never really peppery. I liked ’em enough to plow through the whole box in one sitting. Given my present dueling feelings of bloat and guilt, this is not something I’d recommend trying. 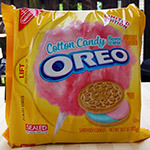 But it is a pretty strong testament to Nabisco’s flavor makers. Still, Cranberry & Sage Triscuits aren’t meant for mindless munching. No, these are EVENT crackers. Crackers you DO THINGS with. 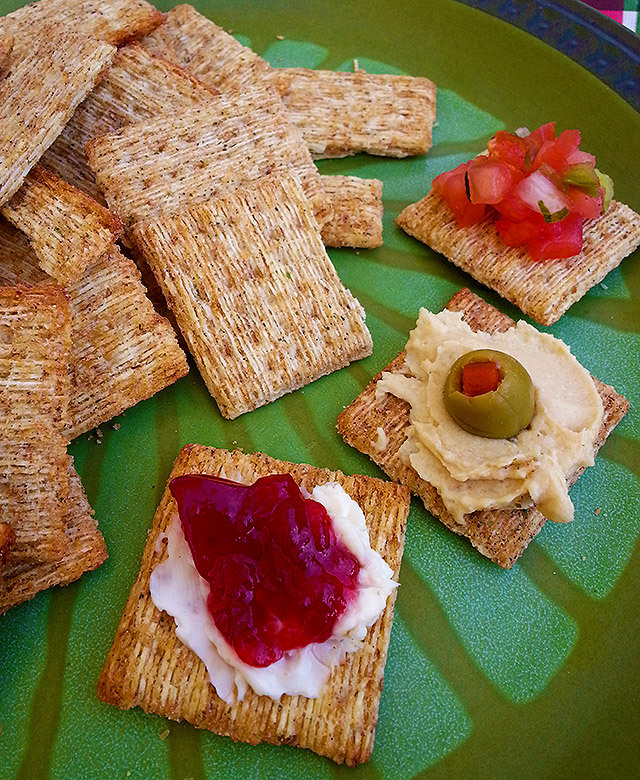 Crackers you serve as holiday appetizers, topped with whatever’s in your refrigerator. I’ve associated Triscuits with high-end holiday hors d’oeuvres for as long as I can remember, and if you doubt that, here’s the proof. Thing is, “normal” Triscuits really don’t have that ambiance. 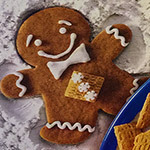 People think of them as “cheap.” So it’s nice to finally get a Triscuit that was specially formulated to join the holiday table without marking the hosts as trash. Allowing that I should’ve crumbled the crackers more than I did, the end result was still delicious. 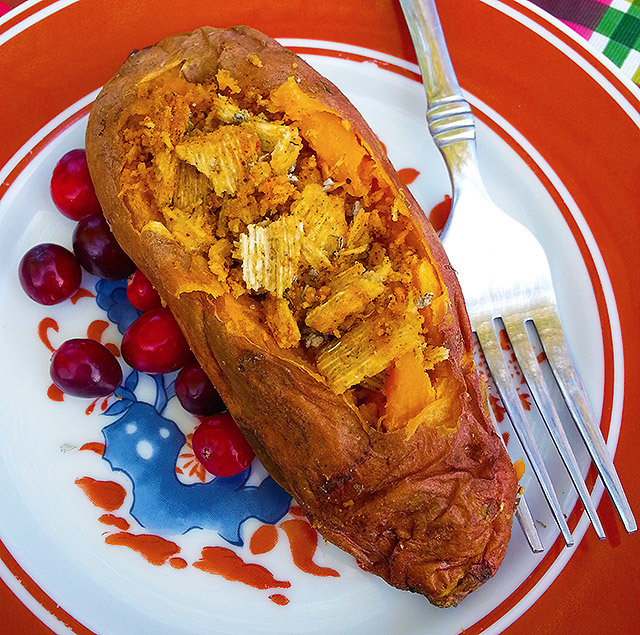 I’m not a big sweet potato guy, but I’ll eat anything covered with crushed Triscuits. Plus, from the right angle, it looks like a futuristic car filled with a family of broken crackers. That improves things by a full letter grade. On the box’s side panel was an even better recipe. These things! 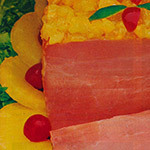 The idea is that you can turn your Thanksgiving leftovers into sky-high towers of nonsense, each with a Triscuit base. 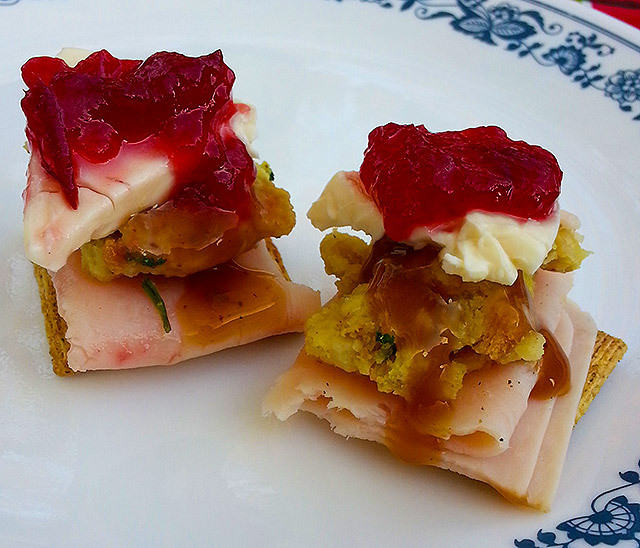 From top to bottom: Cranberry sauce, brie, gravy, stuffing, turkey and one Triscuit. (Well, you’re supposed to use brie, but I wasn’t about to spend $8 for this one photo. I just used some generic spready cheese instead.) They’re as delicious as they are impossible to handle, and if I find myself needing to entertain on Black Friday, my guests are most definitely going to eat Jenga stacks of manhandled leftovers. OVERALL SCORE: Let’s say 8 out of 10. I dug them, but I’m an admittedly easy sell, as both Triscuits and cranberries are high on the list of things I think about to get through bad days. Even so, they’re absolutely worth trying. I can think of no other cracker that’s been so meticulously reworked to fit in with the holiday season. Yes, this includes snowflake-shaped Ritz. 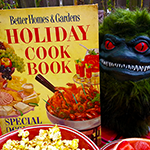 2017’s Best Holiday Junk Food, Part 1! Holiday Food Ads from 1983.